Band regulars include some of the finest traditional musicians in Northumberland. Nathan Armstrong from Shilbottle is a shining star in the new generation of Northumbrian musicians. Whether playing lead accordion or second box, Nathan is an enormous asset to the Castle Band. Nathan has just completed the four year degree course in Folk and Traditional Music at Newcastle University. Definitely a young man to watch for the future. Ex-headmaster, Dr Anthony Robb is a great dance band fiddler with a superb driving Northumbrian style. However his main claim to fame (apart from his refusal to use Grecian 2000) is his outstanding piping. He has played the Northumbrian pipes for over 30 years and featured on 9 albums. Having won over 40 competitions in his early career, he is now in demand as a tutor and judge. Along with Heather (see below) and others, Anthony has released very successful CDs of pipe and fiddle music with his band "Windy Gyle". Full details of Windy Gyle are on Anthony's website: www.robbpipes.com. David Normanton is the consummate host for ceilidhs and barn dances His humorous and good-natured approach enables him to guide, cajole and entertain all kinds of dancers, from the experienced to the enthusiastic novice. David started his involvement with traditional music when he joined the legendary Killingworth Sword Dancers in his early twenties. After a successful stint with the KSD he went on to become the popular front man of the famous North East folk group and ceilidh band, Stanley Accrington and the Third Division North. More recently David is a member of Northumbrian folk group, the Tight Alnwick Gadgies, as are Anthony and Colin. David has now retired from the band and we need to organise a photograph of our new caller, Ruth Ball. Watch this space! Now a resident of Alnwick, Stuart Snow is originally from the central belt of Scotland, from a town which he refers to as "Falkirk Nil"
(Yeah. It's because the two words usually seem to come together on Radio Scotland sports reports). Stuart inherited from his piper father a keen appreciation of highland pipe band music, an appreciation which led him to join Morpeth Pipe Band for a while as a drummer. He is one of only two Castle Band members who have ever listened to a Highland pipe band CD all the way through in one hearing. Heather brings the benefits of a formal musical education to the band, as well as an air of much-needed quiet elegance. Although a fairly recent convert to traditional music Heather (under the influence perhaps of her new husband, Anthony Robb) has rapidly developed a good traditional style and the band makes good use of her great fiddle sound in the harmony lines which overlay many of our tunes. 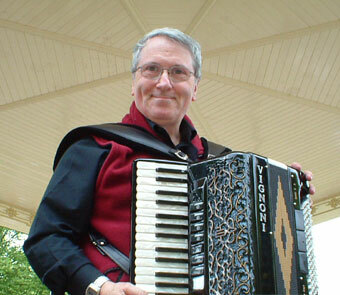 Colin Bradford plays the accordion and generally acts as the band's driver, haulage company, PA supplier, printer and hon. secretary. Colin is well known throughout Northumberland for the new tunes he writes which have won a string of first prizes in competitions at Alnwick, Morpeth and Rothbury. Like David, Colin's involvement with traditional music began over thirty years ago with the Killingworth Sword Dancers. The Castle Band was the first spin-off band spawned by the KSD (followed later by Stanley Accrington & the Third Division North). After stints with The Castle Band (Mark I and Mark II), the Harvesters, Stanley Accrington & the Third Division North, and the great Newcastle Electric Ceilidh Band, Colin had a decade out when work took him to Tayside. Since his return to Northumberland in 1997 he has been involved (with Anthony) in Hotspur's Heroes and (with Anthony and David) in both The Tight Alnwick Gadgies and the Mk III version of The Castle Band. Colin was also the musical director of BorderBox, a band for young fiddlers and accordionists in Northumberland. Colin's work with BorderBox and a long stint as Joint Musical Director of Alnwick Pipers' Society have enabled him to develop an interest in writing harmonies and band arrangements for traditional music. Whenever the opportunity arises, we also like to have playing with us in the band two of our favourite guest musicians, Kathy Anderson (piano) and Stewart Hardy (fiddle). Click here for a sound snippet of Stewart with Anthony and Colin.